A standard style feather banner with a large branding area. Manufactured with a premium grade mounting kit. These banners are the perfect promotional tool for events, trade shows and promotions. The Bow Banners come as a complete kit, with a ground stake, carry case and all equipment required for setting up. We also supply optional water weight or stand fitting for hard surfaces, this is available as an extra. Banners come single side or two sided with full colour digital printing. We offer multiple sizes and wind rating bases. See below for information and specifications. *wind ratings are an approximate guide only. DynamicGift can not be held liable for any damage caused by incorrect fastening of banners or banners that are exposed to windy. For liability purposes we recommend you seek an independant evaluation of the area that the banner will be used and if it is safe for it to be placed in that area. As Dynamic Gift will not be held liable for any damage or injury caused by the products use. Visible recognition benefits businesses in numerous ways, yet many companies never stop and consider how to increase this recognition. Those who make the time to do so, however, often find feather banners are the solution they are searching for. Feather banners allow a business to advertise a sale, announce a new product, or transmit a message to consumers with ease, as the banners draw the viewer's eye quickly and easily. As a result, the business obtains a good return on investment and brand awareness increases. Companies love the feather flags and the low costs associated with them also. Feather flags are incredibly easy to use, and they can be moved from location to location. This is of great importance in fluid situations where individuals may move from place to place throughout the day or the event or different groups may be present in different locations. The flag can be moved to be visible when they arrive at each new destination or to reach the various groups. For example, a company may set the banner up at the beginning of a bicycle race and move the banner to the middle of the race course once the riders depart. They can then relocate it again once the riders have passed the mid-point of the race and move it to the finish line. Doing so allows more people to see the banner. Wind banners are, likewise, great for those situations where space is at a premium, as they draw attention to a business without taking up a great deal of room. These flags are highly visible from a distance and are made using high-quality materials to ensure they hold up when exposed to the elements. In addition, companies choose from a variety of options to ensure the feather banner meets their needs in every way. Buyers discover they have a range of options. 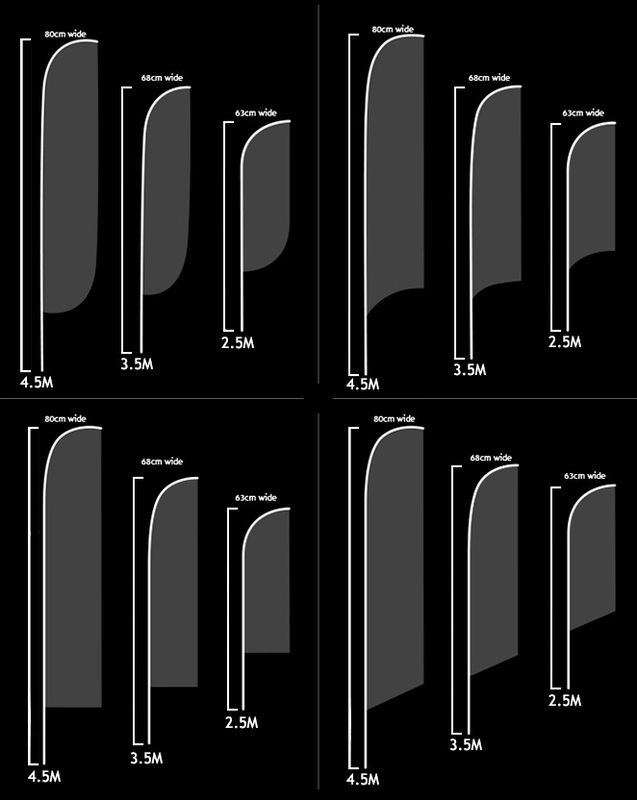 Select from a variety of sizes and determine if single or double side printing is desired, as both options are offered. Wind rating is of concern to many, thus buyers need to review the bases to figure out which base will be of most benefit. 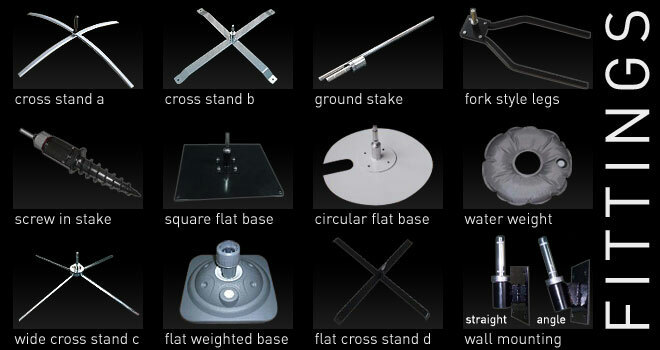 Metal cross stands and spikes are only two of the many solutions offered today. All are made using oxford polyester and are printed using a special dye sublimation process. The print is locked into the material to prevent fading and a non-toxic formula is used to coat the flag to increase its durability during exposure to the elements. Purchasers find the quality of the flag is one thing that is never compromised, regardless of the options selected. Feather banners may be used in a variety of locations. Often seen at trade shows, the wind banners are also suitable for a mobile exhibition or car yard. They may be found on a store display or as a way to draw consumers into a retail location. Utilize a feather banner in place of permanent signage, relocate it as needed, or advertise a special event with the help of this advertising item. Sporting events are another great place where these banners come in handy, and these are only a few of the many options available to businesses and organisations. Once a feather banner is obtained, a business will likely find numerous other uses for it. New Zealand remains home to numerous businesses. Standing out in a crowded field may appear to be extremely difficult, yet this doesn't need to be the case. Blade banners are a great way to draw more attention to a business or organisation without spending a fortune to do so. Be sure to check out the numerous options available today, and discover why so many businesses are now choosing this advertising method. Once you do the same, you may find you want to use these banners in numerous locations.